As an added service, we offer FLIR brand thermal imaging technology to uncover even more information about your home! There are no '"Gimmicks" here. Anybody who tries to convince you that infrared cameras are not a valuable tool in the home inspection process is ignorant, proorly trained/ informed or simply does not want to invest in the technology. Additionally, they are not likely willing to take the time to get certified either. 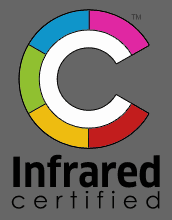 At Check Mark we have already been trained & certified, have invested in 4 FLIR Brand IR Cameras and INCLUDE this technology on most inspections as a courtesy. EVERY technology has its limitations but they also have many advantages! Let us show you how thermal imaging can benefit you. The above video provides a quick tour of the world of Infrared Thermal Imaging as it applies to Home Inspections. The presenter, John McKenna, is the Senior Instructor at the NACHI approved CIT training center and was my trainer.